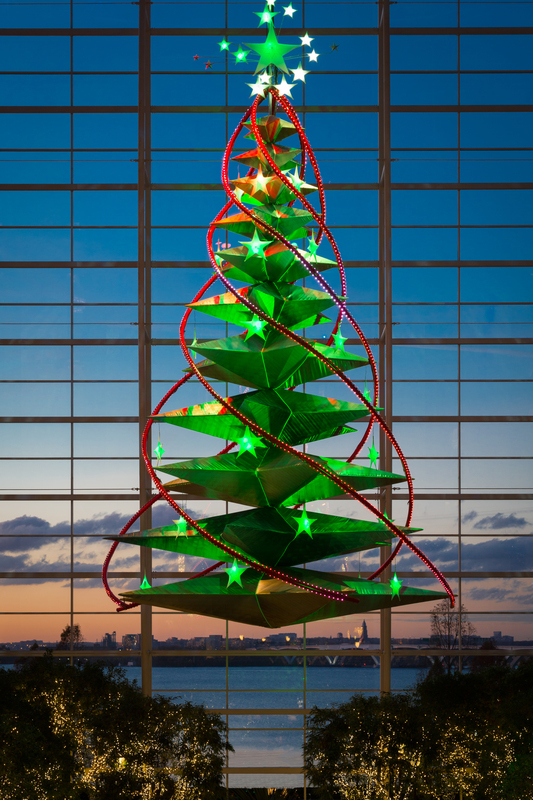 Christmas On the Potomac 2017- Better than Ever! 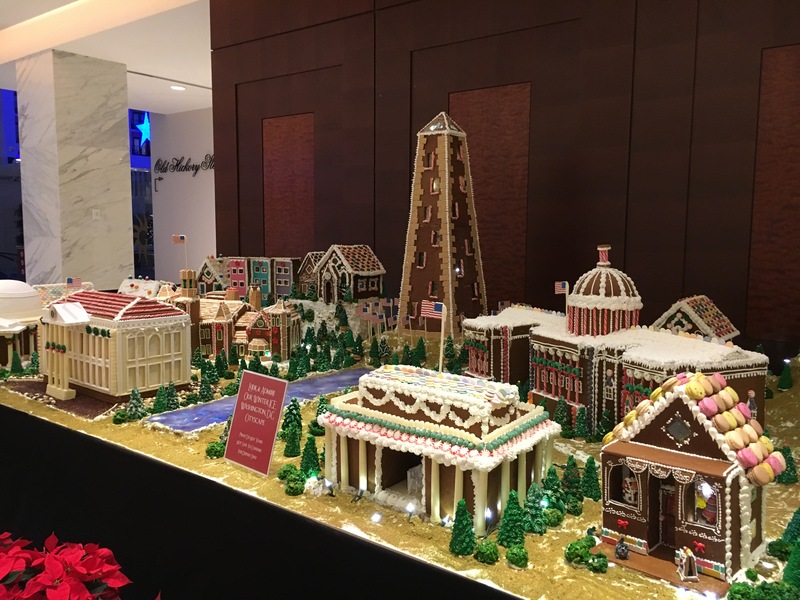 Christmas On the Potomac 2017 – Better than Ever! I am officially in the holiday spirit now! The tree lighting here in the Harbor took place a little bit early for my taste (November 12th) but I have to admit that it did give me a nudge toward getting psyched up for the season. As I write this I am also making my list for my contributions to Thanksgiving dinner – that will take place tomorrow – and watching one of the many Christmas shows on Hallmark….don’t judge me. It’s going to be a fabulous holiday season. The 1964 TV classic, Rudolph the Red-Nosed Reindeer, is this year’s theme for ICE!. Presented by Pepsi®, the 9-degree walk-through attraction features 13 scenes of more than two million pounds of hand-carved ice sculptures. All of everyone’s favorite characters – Rudolph, Hermey the Elf, Bumble the Abominable Snow Monster, Clarice and Santa– come to life. Probably my favorite part of ICE! 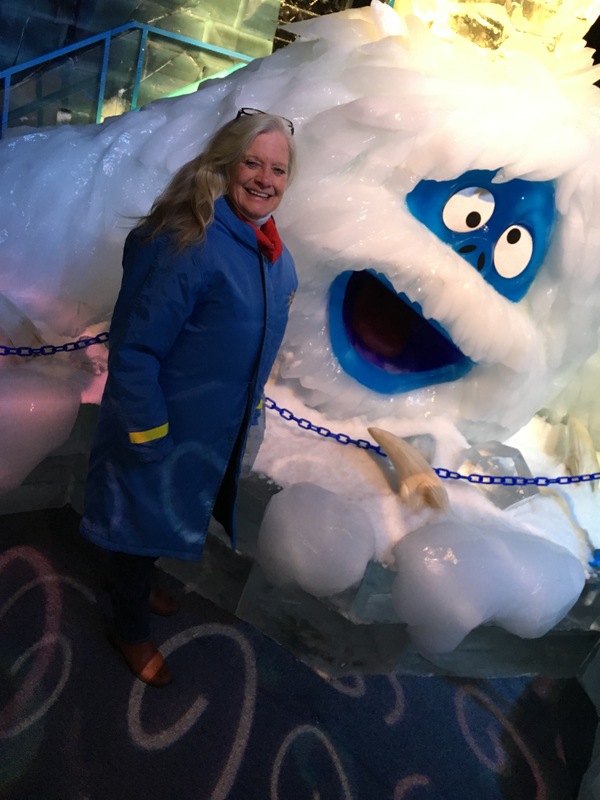 each year is the thrill of sliding down the two-story tall ice slide. This year the slide is in the Island of Misfit Toys. I am probably one of the oldest, if not the oldest, participants at 64. This year I went down twice! 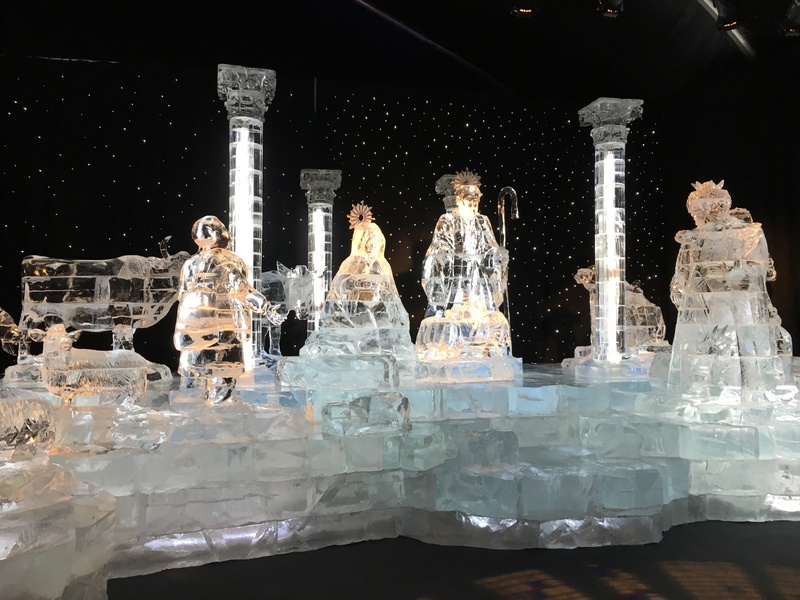 As in years past, the attraction concludes with a breathtaking Nativity scene carved from crystal ice and set behind a twinkling light curtain. This is very impressive. Photos don’t do it justice. The resort truly does turn into a Christmas wonderland during the season. Considering that there are over 2 million lights involved, both the exterior and the interior are a sight to behold. This is the second year for the Starlight – or Jetson as I refer to it – Christmas tree. It is a 55 foot tall structure suspended from the ceiling of the 19 story Atrium that is lit three times during the evening accompanied by a laser light and fountain show set to the tune of an array of holiday tunes. I can sit through all three lightings with my adult beverage at the Belvedere Lounge just off of the lobby. Oh, yeah, the nightly indoor snow fall ads to the ambiance. 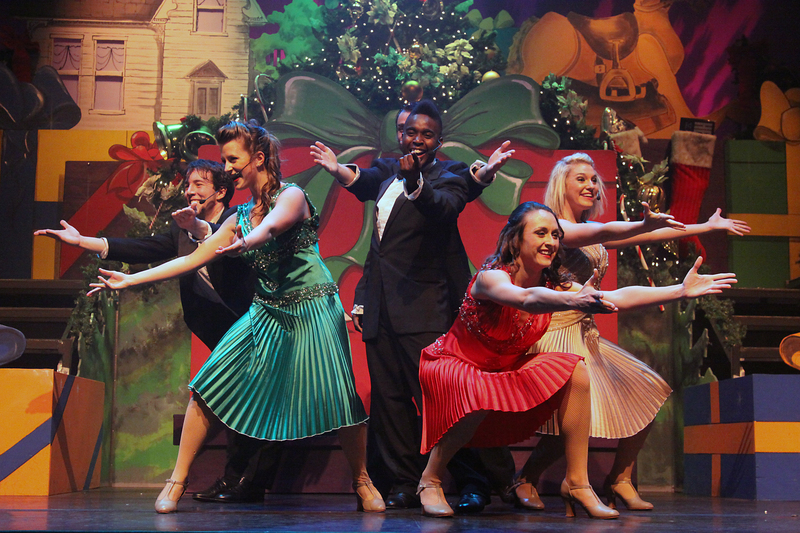 New this year is the addition of a live entertainment show, JOY – A Holiday Spectacular. You can enjoy the rich harmonies of classic and modern songs that celebrate the joy of the holiday season performed by Gaylord National singers. These guys and gals are great! The costume changes are almost as impressive as the music. JOY takes place every evening prior to the tree lighting shows with the exception of Wednesdays. Floor seating is offered at $11.99 per ticket, however, you can enjoy the show for free from everywhere else in the Atrium and at aforementioned Belvedere Lounge. Also new this year is a 20-foot wide Washington, D.C. gingerbread display in the lobby. I am fascinated with it. I have decorated a couple of gingerbread houses in my day so I have an appreciation for all of the work that went into this display. The Christmas Village is in full swing and has a new ice skating attraction. There wasn’t anyone on the ice when I walked through but I am surprised at how big it is. Will check it out at some point. The carousel and train rides, Cookies with Mrs. Claus, photos with Santa and a Gingerbread Decorating Corner and the Build-A-Bear Workshop are all back this year. There is a fee for these attractions. To enjoy several of these at a reduced rate, the resort has created Play and Save packages starting at $29.45. And how about taking a Mistletoe Mixology Class? This is something that I am definitely interested in. For visitors 21 and older, Gaylord National’s beverage director has created a class designed to teach participants the basics of cocktail making. The 90-minute hands-on class includes crafting three unique holiday cocktails paired with hors d’oeuvres provided by the resort chef. The class costs $29.00 and is available select dates during Christmas On The Potomac. Check the website for details. Outside of the Gaylord, the Harbor has lots going on during the season. Check out some of the activities in the calendar in this section. Also, the 1st Anniversary of the MGM Grand Hotel and Casino takes place this month. December 8th marks the day. I imagine there are all sorts of special things taking place there! Be sure to check them all out! Merry Christmas, Happy Hanukkah, Happy Kwanzaa and whatever else any of you readers may celebrate! Let’s make this a very happy holiday season!